WHAT?! HUH?! As you may be able to tell from my confused grunting, I’ve just finished Bioshock Infinite. And what a game it was, somehow becoming the smartest and cleverest yet most action packed and thrilling game I’ve ever played. I am a huge fan of the Bioshock games. I love both but the first Bioshock is one of my favourite games of all time. So I was hyped for Bioshock Infinite, really, really hyped. But the thing that usually comes with so much hype is crushing disappointment. 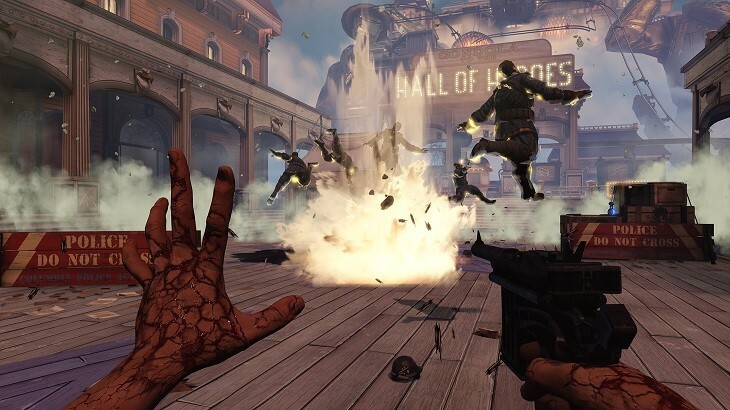 Bioshock Infinite sidesteps this however and despite me having watched hours of gameplay footage and reading countless articles about the game in the months before release, Infinite feels extremely exciting to play. The protagonist of the adventure is Booker DeWitt (who on the cover of the game bares just the teensiest resemblance to Jon Hamm) Without spoiling TOO much, Booker isn’t the most reliable of protagonists. He’s a gruff, violent former Pinkerton Agent/mentally scarred war veteran. The second most important character (or possibly first most) is Elizabeth, a sometimes almost childlike woman who has been imprisoned in a tower for years. Despite this, the two characters still manage to be funny and charming and have the best conversations and back-and-forths I’ve seen in recent memory. That’s also a great array of supporting characters from the religious Comstock to the industrialist; Fink. There are also two mysterious character who follow you throughout the game named (at least at first) as simply “a gentleman” and “a lady”. These two are really quite bizarre and as the game goes on they become more and more unnerving. Anything else I said would be a spoiler, but they have to be witnessed. The plot is simple, in 1912 Booker DeWitt must travel to the floating city of Columbia and rescue Elizabeth to pay off his gambling debts. DID I SAY FLOATING CITY? YEP! Oh yes, it’s a floating city. The whole world of Columbia is a cool steampunk wonderland, and boy is it beautiful. The world just feels alive, like it lives on when the player isn’t present. As if it has lived on before you even arrived. The team at Irrational Games do a great job at fleshing out the history of this city, bringing the people, the world and the turmoil at the heart of the city to life. Now, I can see how people can get put off by the gameplay by thinking it’s just another run of the mill shooter. Well those people are silly for thinking that. It is SO much more than a shooter. The gameplay is so much FUN, and not in the same way that Call of Duty is fun. As well as the many guns at your disposal you have vigors, which are similar to Bioshock 1‘s plasmids, just not as integral. Shooting/burning/electrocuting/summoning crows from your hands are just a few options you have in combat. Not to mention the help Elizabeth can provide via “tears” to other worlds. The combat is fast paced thanks to the sky-rails around the world that allow Booker to travel from area to area at immense speed. On top of this you have certain choices to make throughout the game, and the good choices are not always the obvious ones. The combat serves as a very fun way to get through the mountains of guards and rebels that Comstock and the Vox Populi throw at you, but it’s the story that you must experience. A story involving alternate realities, quantum physics and philosophy galore! Why anyone, gamer or not, would pass up the chance to experience the most exciting, engaging and downright wonderful story ever told in a video game is beyond me. This is the best story told in a game this generation, if not ever. Do yourself a favour and play it, you can’t avoid spoilers forever. Ha, trust me it’s great 😀 Also, I need someone to talk to about it!